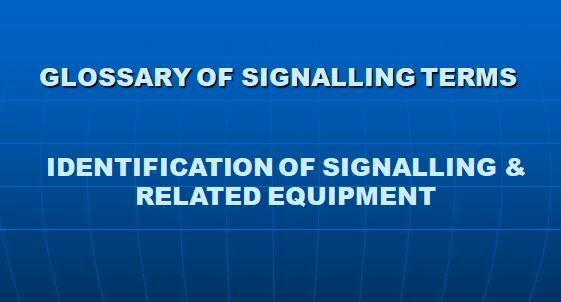 This standard defined the meaning of commonly used signaling terms to ensure that each term is clearly understood and always use to convey the same meaning. The glossary is arranged in alphabetic order. ALPHANUMERIC ROUTE INDICATOR A ROUTE INDICATOR that conveys its information by alphanumeric characters. APPROACH LIGHTING The lighting of a SIGNAL only on the approach of a train. 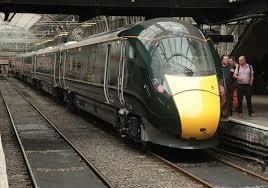 ATP Abbreviated term for AUTOMATIC TRAIN PROTECTION. BANNER REAPEATING SIGNAL A SIGNAL that provides the driver with preliminary information about whether a SIGNAL is ON or OFF. CD Abbreviated term for CLOSE DOORS INDICATOR. FLASHING DOUBLE YELLOW (ASPECT) Displayed by a COLOUR LIGHT SIGNAL, informs the driver to expect the next MAIN SIGNAL at FLASHING SINGLE YELLOW. HEADWAY The shortest distance or time interval between Two following trains, so that the second train can run at its normal operating speed without being restricted by the SIGNAL ASPECTS. train has passed the signal. LOS Abbreviated term for LIMIT OF SHUNT INDICATOR. NX Abbreviated term for ENTRANCE – EXIT SYSTEM. SPAD SIGNAL passed at DANGER. SUPPRESSION (AWS) Inhibition of the operation of AWS track equipment for movements to which it does not apply. TORR Abbreviated term for TRAIN OPERATED ROUTE RELEASE. 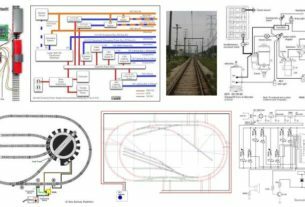 To define the principles for ensuring that items of signalling and related equipment are clearly and unambiguously identified. * Confusion does not arise in verbal or written communication when geographical location and equipment are the subject of communication. * Events, incidents and operational engineering activities can be accurately and concisely described. Network Rail, as infrastructure controller, shall ensure that a procedure is in place that ensures that allocated identities are documented. Geographic Identity Each of the following features shall have a name. * Ground Frame or Ground Switch Panel. * Tunnel, Viaduct, Swing bridge etc. Each line and siding within or adjoining a signaled area, shall have an identity. Each signal box or locality shall be assigned a code which is unique as far is reasonably practicable. Manually controlled block system shall be named by appropriate reference to the line and/or the ends of the block section (e.g. AA-BB DM Block). Each track section shall have an identity. The identity shall generally be unique to the signal box or locality as applicable. 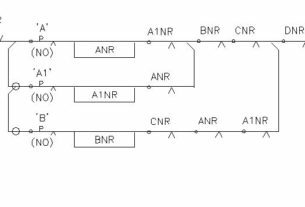 Train detection equipment associated with track section shall be identified by the track section identity and where necessary suitable suffixes. Each signal shall have an identity that is unique to the signal box or locality as applicable. Signals worked by levers shall be identified by the lever number. The following signal suffixes shall be used and the meanings are exclusive. * BR for a banner repeating signal, the number being as for the repeated signal. * CA for a co-acting signal, the number being as for the primary signal. * R only for a distant signal worked from the same lever as a stop signal, the number being the lever number. * Position light shunt and limit of shunt signals. Identification plates are not generally required at other types of signal or board but the provision of adequate identification plates or label shall be considered. * RA indicator(s) with signal, or with platform where there is no relevant signal. * Points indicators with points. Each point end (as defined and including catch points and hand points) worked or detected by a signalling function, shall have an identity that is unique to the signal box or locality as applicable. Points worked by levers shall be identified by the lever number. Each lockout section shall have a numeric identity unique to the signal box. Each staff warning system shall have a place name and associated locality code. All balises, loops and other track equipment used for data transmission between track and trains shall be uniquely idetified. Where it is necessary for the operation of the signalling system for train-mounted equipment to report the identity of the train or vehicle on which it is installed, the infrastructure controller shall consult with the train operators to determine the system of identification to be used and shall establish and maintain a system for the allocation and recording these identities.